Advanced polish designed to restore color and remove medium oxidation! Marine 31 Gel Coat Gloss & Color Restorer is designed to restore brilliance and shine to your boat's gel coat. 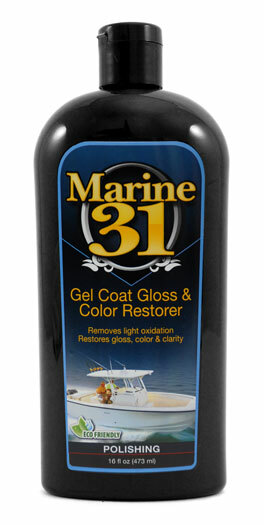 Marine 31 Gel Coat Gloss & Color Restorer quickly removes medium oxidation, chalking, yellowing and surface staining. Proprietary diminishing abrasives work quickly, while Marine 31's advanced lubricant system provides a long buffing cycle and minimal dusting, even in the Florida sun. Marine 31 Gel Coat Gloss & Color Restorer delivers exceptional performance for users of all skill levels. This advanced gel coat polish can be used by a rotary polisher or a dual-action polisher with outstanding results. Proprietary diminishing abrasives restore a brilliant shine by quickly eliminating oxidation, stains, yellowing and dead gel coat. Marine 31 Gel Coat Gloss & Color Restorer is easy-to-use. Because it was formulated in south Florida, it had to be sun friendly, have a long buffing cycle, and wipe away with ease. Marine 31 is dedicated to persevering the intricate ecology of our world's marine life, so Gloss & Color Restorer is environmentally friendly and harbor-safe. A Tip From The Captain�s Seat: Make sure to clean your polishing pad frequently for best results. Follow up polishing with Marine 31 Final Step Polish for brilliant reflections.